96L6E “Cheese Board” is a 3D early-warning and acquisition radar operating in C-Band designed to replace the 36D6 “Tin Shield B” and 76N6 “Clam Shell”. It is used in conjunction with the SA-10 “Grumble” (S-300) and SA-21 “Growler” (S-400) theatre defence missile systems. Three operators are needed to run the set. Up to five operator consoles are provided. The phased-array antenna with 96 radiating rows employs mechanical beamsteering in azimuth and electronic beamsteering in elevation. 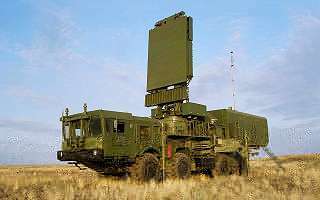 The radar is a frequency hopping design intended to provide high jam resistance and high clutter rejection. There are two operation modes implemented: Low altitude targets can be acquired by constraining the mainlobe elevation angle between -3° and +1.5° using an antenna rotation of 5 rpm. This slow rotation allows a better clutter rejection with a subclutter visibility up to 70 dB. All altitude targets can be acquired by constraining the mainlobe elevation angle between -1.5° and +20° using an antenna rotation of 10 rpm. As a third mode the radar can operate in a sector search. The 96L6E measures range, azimuth and elevation and performs up to 100 local tracks automatically. It classifies four different target types: aircrafts, helicopters, UAVs, and missiles. After relocation the 96L6E can be set up by three operators in less than 5 minutes.